Nestled in the northeastern Santa Fe area, the Santa Fe Summit neighborhood offers homebuyers an exceptional opportunity to own property with gorgeous views of New Mexico’s natural beauty. This gated neighborhood is in an excellent location, and you will have easy access to nature and metropolitan life when you choose to reside here. The luxury single-family homes in this neighborhood provide privacy while also incorporating the stunning natural scenery. Available properties in Santa Fe Summit include fabulous single-family homes and estates, as well as wonderful residential land plots. When you choose to live in this neighborhood, you will have many opportunities to enjoy everything the Santa Fe area has to offer. For example, the beautiful views outside of your window may inspire you to explore nearby Hyde Memorial State Park. Envision an invigorating hike, an exhilarating bike ride, and a delicious picnic lunch. These activities can become part of your everyday life when you live in Santa Fe Summit. When you are ready for a metropolitan adventure, you will not have to travel a long distance to Santa Fe’s Plaza. This city has earned its reputation as a lively arts hub, and there will always be something new for you to discover. Whether you are attending the Santa Fe Farmers Market or visiting the Museum of International Folk Art, you will have fun exploring this dynamic city. Fun local festivals, such as the annual Santa Fe Independent Film Festival, are also excellent ways to fill your free time. When you are ready to relax, your peaceful Santa Fe Summit single-family home will be awaiting your return. Friendly neighbors, spectacular scenery, and plentiful entertainment options ensure that you will enjoy living in this gated neighborhood. 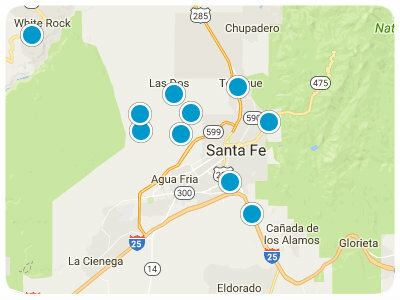 Homes for sale in Santa Fe Summit, New Mexico, are ready to impress you, and you are sure to find something that suits your style among the unique properties that are available. Whether you are interested in land or a beautiful single-family home, real estate options in this neighborhood are sure to pique your interest. If you are ready for more information regarding Santa Fe Summit, New Mexico, real estate options, please do not hesitate to contact us.